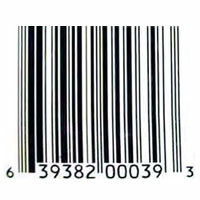 In the UPC-A barcode, each digit is represented by a seven-bit sequence, encoded by a series of alternating bars and spaces. The manufacturer identification number is the first six digits of the UPC number — 639382 in the image above. The next five digits — 00039 — are the item number. A person employed by the manufacturer, called the UPC coordinator, is responsible for assigning item numbers to products, making sure the same code is not used on more than one product, retiring codes as products are removed from the product line, etc.